Ludus Magnus, the Great Gladitorial Training School, was the largest and most prestigious gladitorial training school in ancient Rome. It was built between 81 and 96 AD by emperor Domitian, whose father and older brother, Vespasian and Titus built the Colosseum. As its name implies, it was the principal of four gladiatorial schools set up by Domitian in the 80s AD, the others being the Dacian, the Gallic and the Matutinus or Morning School, which presumably trained combatants for the animal-hunting shows which were typically held in the morning. 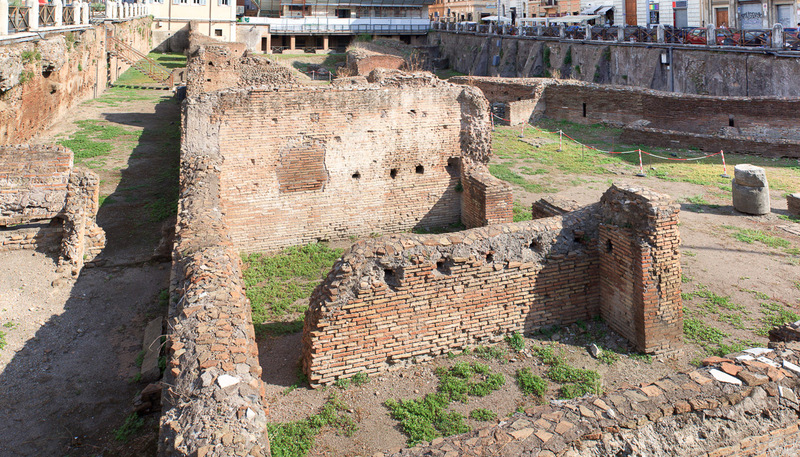 The ruins visible today were built by Trajan between 98 and 117 AD as part of a second building stage. 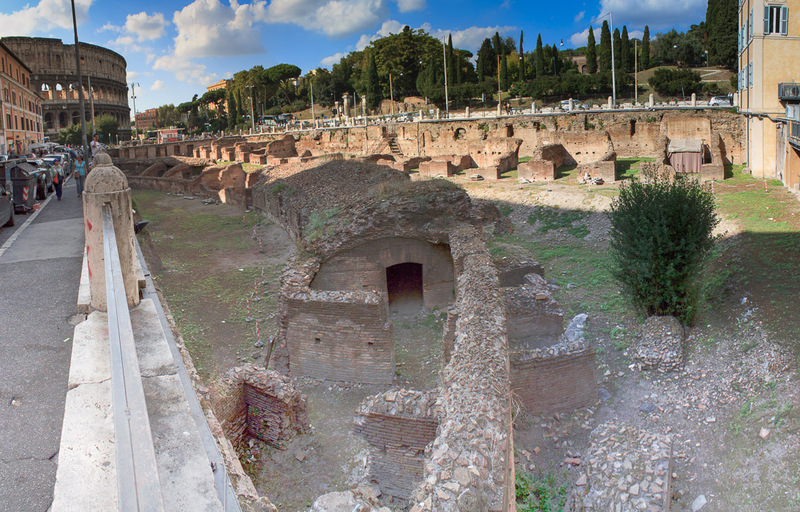 The Ludus Magnus is located right next to the Colosseum, and used to be connected to it by a 6-foot-wide tunnel which attached to the Ludus Magnus at its southwest corner. The ruins were discovered in 1937, and appear on some of the fragments of the Forma Urbis. An ellipsoidal arena in which the gladiators practiced was at the center of the Ludus Magnus. It was surrounded by a small grandstand for spectators, which had a four-sided portico of about 300 feet per side, with travertine columns. 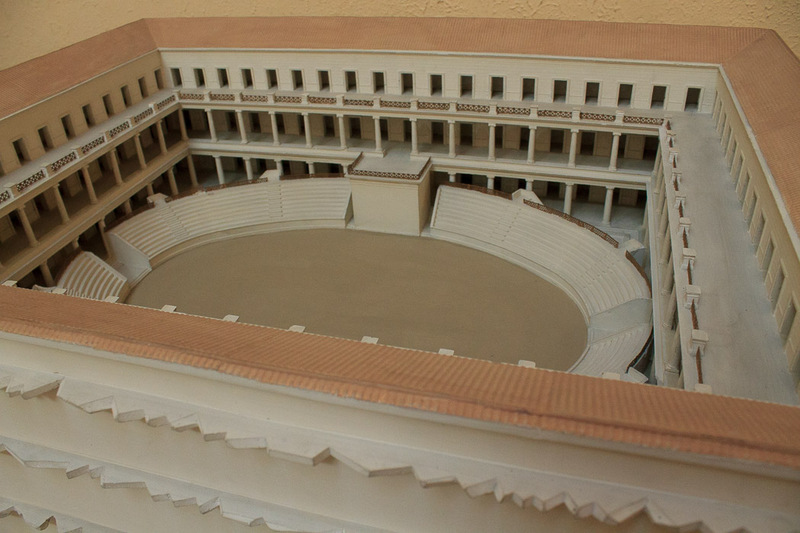 A model of this (1st photo below) is in the Museum of Roman Civilization. Outside of this portico were barracks where gladiators lived and equipment was stored. Small triangular fountains were at the four corners of the portico, and one of them has been restored in the northwest corner of the portico (2nd photo below). The spectators' entrance to the Ludus Magnus were built on the main axis. One is at Via Labicana, at the center of the building's northern side, and was probably for important people since the grandstand was decorated specially on this end. See all Ludus Magnus photos. The Ludus Magnus lost relevance, as did the Colosseum, when gladiator performances ended. By the middle of the 6th century the area had been taken over by churches, some of which were built to commemorate martyrs killed in the Colosseum. What is visible today as you walk around the block and peer down into the Ludus Magnus from all sides, is one side of the oval arena (1st photo below), the foundations of the grandstands (2nd photo above, on the outer edge of the oval arena), and the foundations of some of the gladiator barracks (2nd photo below). The 2nd photo above makes it clear that only a small part of the Ludus Magnus is visible today. Most of the oval arena, and three-quarters of the grandstands and the portico are still buried under the modern street Via di San Giovanni in Laterano and the restaurants on the other side of that street.